With the invention of nuclear weapons, mankind now has the ability to destroy everything. Previously, we were limited in the scope and scale of destruction we could create – now we can completely wipe out all life on our planet. That changes everything. In the context of Cold War tensions between East and West, ostensibly over which long-dead economist was best, the omnipresent threat of global annihilation was the elephant in the room. Sometimes, during periods of crisis, we actually acknowleged the presence of this monster. But most people did their best to suppress this knowledge and get on with everyday life. The arms race between the two blocs was a constant feature of the Cold War with each side vying with the other to come up with more innovative and destructive means of killing each other. Atom bombs became hydrogen bombs, which went from being carried on planes to being stuck on missiles that were able to reach any part of the globe in minutes. This era was defined by immense levels of spending on more and newer weaponry at the expense of everything else. The sheer, immense horror of what was created is staggering to behold for any sane person. Carl Sagan summed up the Cold War arms race best: “Imagine a room awash in gasoline, and there are two implacable enemies in that room. One of them has nine thousand matches. The other has seven thousand matches. Each of them is concerned about who’s ahead, who’s stronger.” But, locked in this cycle of fear and distrust, in the simple binary world of East-v-West any form of dissent was presented as an act of treason. In an attempt to somehow justify this pursuit of insanity, MAD (Mututally Assured Destruction) was advanced as a serious strategic theory. Now, in the twisted logic and the paranoia of the Cold War, nuclear arsenals were transformed into the guarantors of security and peace. MAD held that our enemies would be prevented from attacking us for fear of retaliation in kind, producing a balance of terror. Various shadowy think tanks devoted time and immense resources towards developing models (such as Game Theory) in an attempt to predict and control the outcomes in this high-stakes global chess game. Yet widespread public disquiet was always present just beneath the surface. It is interesting to see how the popular reaction to the power of these weapons shifted through time as expressed in the movies that dealt with the theme. These are important because they show how the unthinkable was presented to audiences riddled with suppressed anxieties about the subject. These movies also had an educational value. By using identifiable characters they taught viewers what kind of behaviour was expected of them in such a crisis. During the 1950s the consequences of such a war were minimised and survival was presented as a very distinct possibility. Social cohesion was paramount and unquestioning deference to authority figures was presented as being the key to our survival. A particularly good example can be seen in the 1954 TV movie, Atomic Attack (sponsored by Motorola no less). Here, all the horror occurs offscreen and we follow an family straight out of 1950s central casting as they anxiously wait for news about pop who cheerfully put on his fedora and went to work after a wholesome all-American family breakfast. Everybody in the ‘burbs looks a bit concerned about New York getting nuked and all that radiation floating around, but the authorities swing into action and soon have everything under control. The wonders of medicine has everybody up on their feet after an inconvenient dose of radiation sickness. No real need to worry. (Alas, poor pop gets fried offscreen but mom cheerfully perseveres to hold the family together in spite of her unspoken fears for the future). The Cuban Missile Crisis of 1962 changed all that. Popular culture, in tandem with the growth of a generation who were more critical of authority, began appreciate the horrors that could be unleashed by such a war. For example, Panic in the Year Zero! (1962) envisaged the need for rugged individualism and a return to the gunslinging, frontier ways in the face of lawlessness (only for a little while – just until the panic subsided and order was restored). But the idea that everything we took for granted would be destroyed utterly had taken root. Indeed, it can be argued that the presence of nuclear weapons directly contributed to the undermining of traditional authority. Now, a younger generation, presented with a clear demonstration of the failure and incompetence of those in charge (who had created this hair-trigger scenario of global annihilation) lost all faith in the idea that those who ruled over the rest of us were somehow smarter and knew what they were doing. Once that happens, then everything is up for grabs. These developments were paralleled in how nuclear war was represented in the popular media. In Britain this was best explored in the groundbreaking 1965 docudrama by Peter Watkins, The War Game, which portrayed a nuclear attack through the use of traditional documentary filming and editing techniques to produce a fictional film. This movie so alarmed the Wilson government that they put pressure on the B.B.C. to pull the plug (particularly as it highlighted their embarrasing u-turn on their pre-election pledge about unilateral nuclear disarmament). As was stated afterwards; “In the event, the effect of the film has been judged by the B.B.C. to be too horrifying for the medium of broadcasting.” Interestingly, this film reflects the recent past insofar as it portrays the effects of a nuclear attack on Britain in distinctly Second World War terms (just as the American version used mythical elements from the Old West to represent the un-representable for a US audience). Thus, nuclear war becomes a form of neo-Blitz with higher casualties, greater destruction and more radiation, with everybody scurrying around in army-surplus tin helmets left over from the previous war. But in this film, for the first time, we see a more detailed exploration of how nuclear war had the potential to change everything. The optimism of earlier representations disappears. Now, viewers were confronted with representations of terror, injured and sick victims, hastily organised mass-cremations of bodies, food-riots (in a rather dated reference, it notes that even the respectable middle-classes may be inclined towards such lawless behaviour), summary executions by military tribunal and a bleak future of radiation poisoning and death. But I suppose it could be argued that all such depictions were inherently optimistic insofar as they envisaged a scenario in which any human beings would be left alive in the aftermath of an overwhelming nuclear assault. So, in this atmosphere of raw, palpable fear the anti-nuclear movement grew. Felix Greene, a leading left wing figure (whose book Vietnam! Vietnam! I reviewed previously) edited this protest book published in 1963 by the Fulton Publishing Company of California. Using a mixture of journalistic, commercial stock and official government images, Greene produces a narrative which is an impassioned cry for an end to this collective insanity. (In many cases, these images appear to have been chosen solely for their visual impact rather than accuracy in representation. 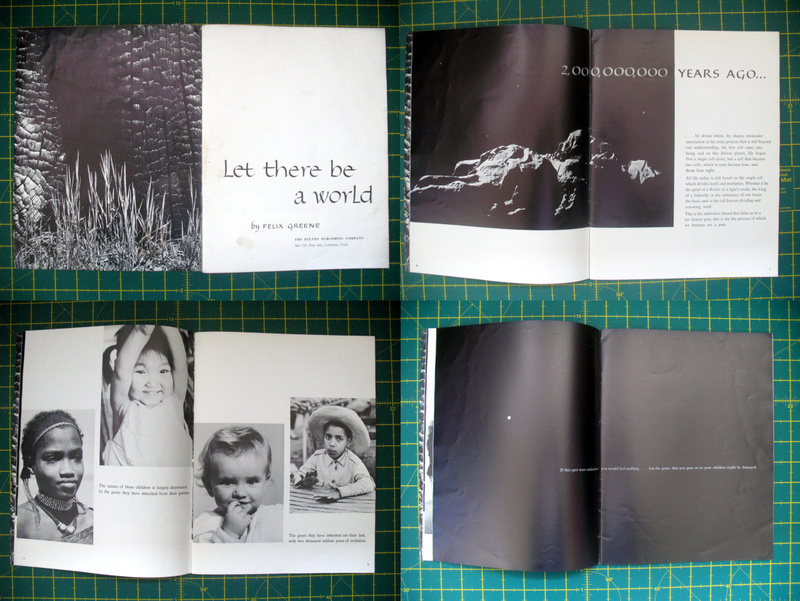 Photographs made by Ansel Adams, Werner Bischof and Andreas Feininger are all used.) 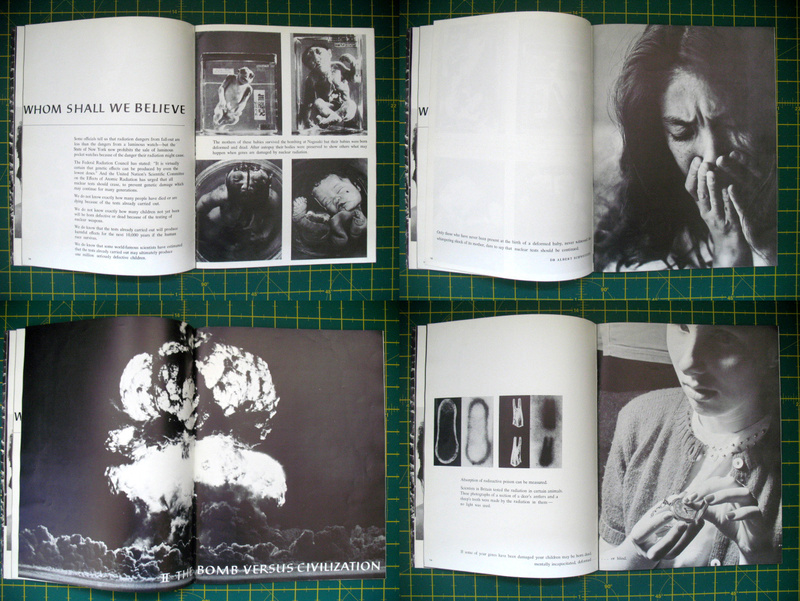 In order to visually represent the invisible dangers posed by radiation, Greene adopts the (probably predictable) strategy of relying heavily upon the imagery of children to illustrate the long term genetic damage caused by exposure to fallout. Such images are used by aid agencies the world over because the message they send is apparently clear and unambiguous, cutting through the empathetic barriers of the viewer who may have difficulty in identifying with distant victims. (By contrast, images of injured adults – who may look different from us, be regarded as our enemies or somehow culpable for their own demise – are less favoured because they may be subject to a more nuanced and less sympathetic response on the part of a distant viewer.) 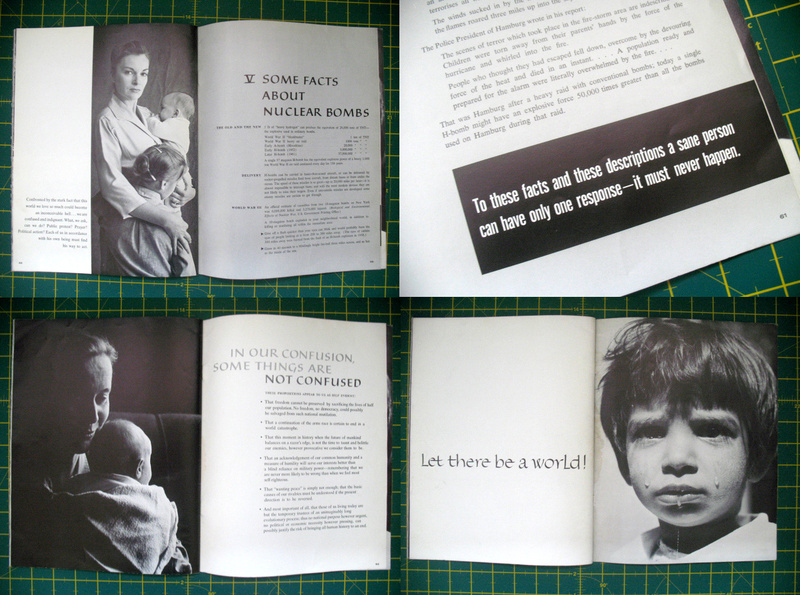 As the text states: “because of the bomb tests already carried out no child anywhere in the world can drink milk that is free of poison caused by radioactive fall-out.” These photographs of healthy and happily innocent children are contrasted with dark images of horrifically deformed, stillborn babies from Nagasaki. The net effect of such an emotive juxtaposition is to produce a causal link between the decisions made in the present with the irrevocable long-term effects they may have upon future generations. The next section of the book deals with the legacy of the past. 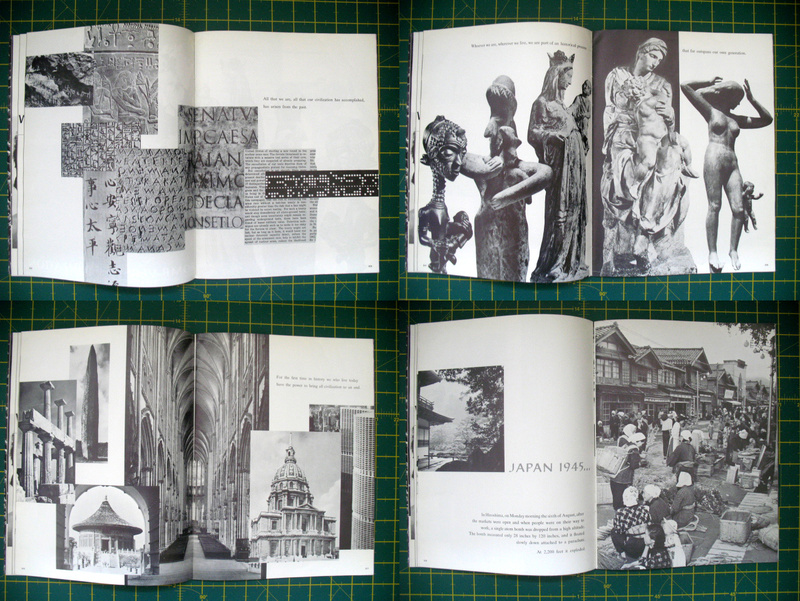 Here, imagery of the civilisations and man’s achievements are combined with a text in which a simplified, linear view of human progress and future development is presented to the reader. 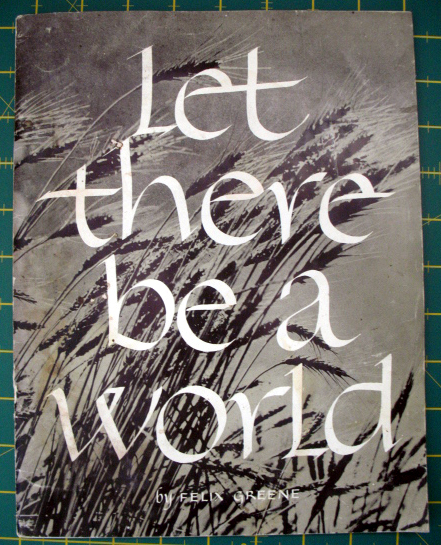 The extensive use of black within the design of the book provokes an ominous, unsettling sense of danger. Here, the present generation are presented as a link in a much longer chain that links the past and stretches far off towards a bright future. Nuclear weapons threaten to break this chain. As visual proof of how everything mankind has accomplished so far can be utterly destroyed, Greene uses Japan as a case study. 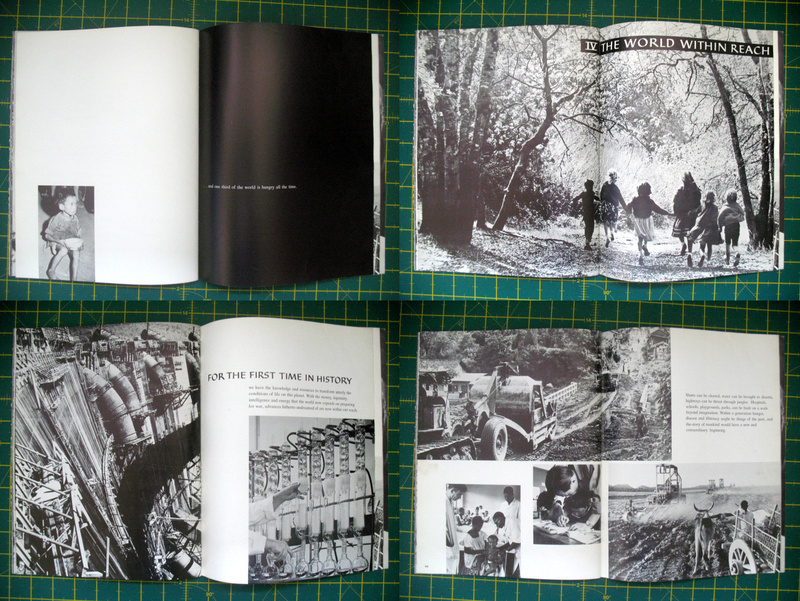 This begins with a full page image of a peaceful Japanese market scene followed by a dramatic double-page spread of post-atomic Hiroshima as a desolate grey wasteland through which a line of dazed survivors trudge. Following this, another double-page spread from Nagasaki appears; here we see a devastated, bleak urban ruinscape populated now by the blackened, charred remains of those who once lived there. 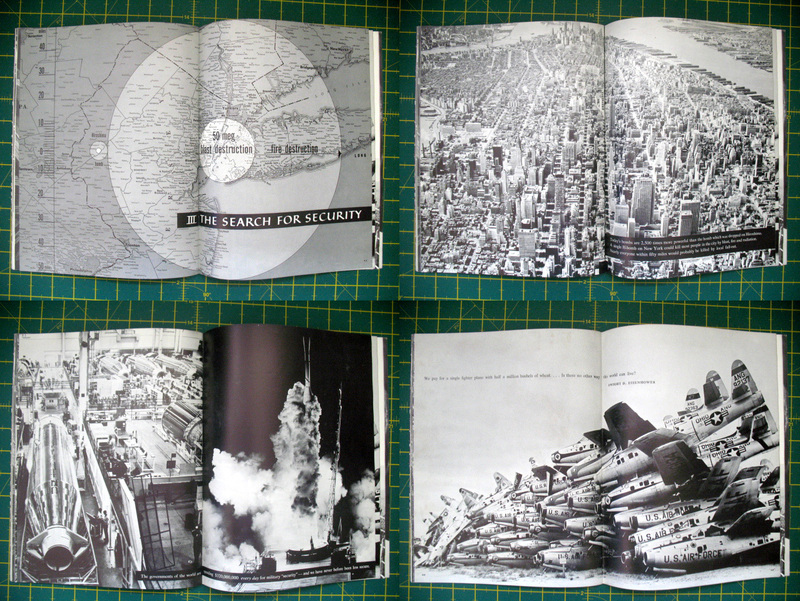 The next few pages depict the survivors. Traumatised and clearly in pain, they are shown in a state of shock, passive in the face of imminent death which they are powerless to prevent. 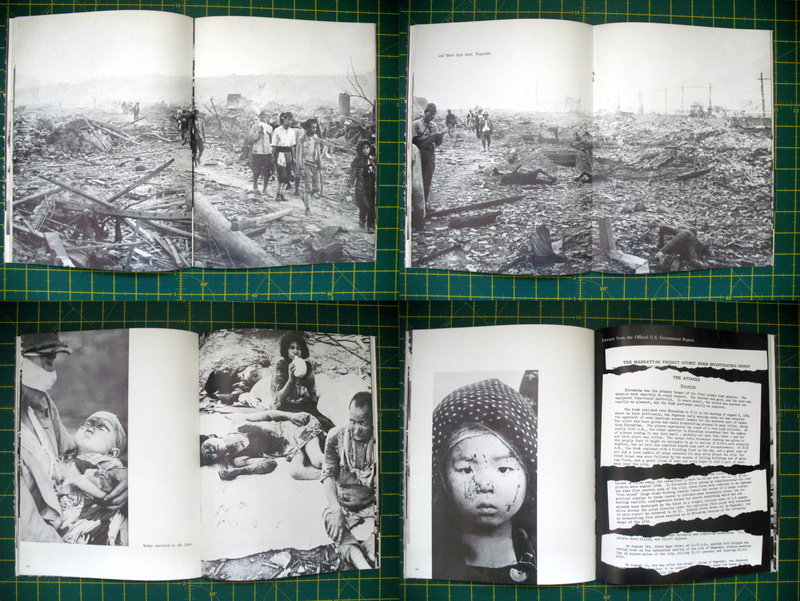 Again, women and children feature heavily in these photographs (Yosuke Yamahata’s images from Nagasaki are used extensively). Due to the distinct racial and cultural difference between the Japanese victims of the atomic bombs and the American viewer of the 1960s, the depiction of women and children as primary victims is used as a device to create empathy and serve as a metaphor for lost innocence. If the previous sections were used to show just how much of a threat nuclear weapons were to life on Earth, Greene uses the next section to undermine Cold War arguments about security; of course we don’t want to have these horrible weapons, but if the other side has nukes then we have to have more nukes. MAD did produce a stable state of constant terror between East and West but at a tragic cost. In particular, this era saw the emergence of the military-industrial complex as a concept to describe the nebulous military, bureaucratic and commercial interests who all had a vested interest in maintaining the status quo. Interestingly, the term was first coined by Eisenhower in an unprecedented farewell speech at the end of his term as office as president in which he warned against this shift of power to unaccountable forces that posed a threat to democratic accountability (Khrushchev termed the Soviet equivalent as the Metal-Eaters alliance). Greene shows us the slick new products of military spending with new missiles rolling off the assembly line ready to be launched from their silos. Yet the security this technology appears to offer is elusive; an image of a pile of junked fighter planes, yesterday’s high-tech wonder-weapons, is captioned with a quote from Eisenhower: “we pay for a single fighter plane with half a million bushels of wheat …Is there no other way this world can live?” The answer to this is provided in the final section of the book which offers a sliver of optimism (in distinctly modernist terms). Although science and technology have brought us to the brink of disaster, it is not too late; they can be used to provide a better future for us all. In the context of early 1960s society, shocked to the core by the Cuban Missile Crisis, fuelled by paranoia and repressed anxiety about the omnipresent possibility of nuclear annihilation, the traditional deference to political authority broke down, particularly amongst the young. Horrified by the nuclear trap that the generation who had fought in the Second World War had bequeathed them, they turned against it. For those who wanted a change in this terrifying status quo their argument was persuasively simple; reduce the tension and get rid of the nukes because the alternative was mass extinction. There was no alternative. Morally, the possession and use of such weapons is completely indefensible. There is no argument you can use to counter calls for peace in these terms. In response, those in authority shifted the debate by arguing that such calls would play into the hands of their enemies and place the Western world in jeopardy. This book is an attempt on Greene’s part to rebut these claims by creating a photo essay that links the past and the future with the terrifying present in an attempt to convince the viewer that this insanity cannot go on. For most of us, such debates have been happily consigned to the past and appear of little relevance today. The problem appears to have been solved. Yet, despite the collapse of the political systems that spawned this terrible arms race, the arsenals remain. While arguments about dead economists no longer have the potential to destroy us all, other factors that produced this situation (such as rivalry between competing states over the control of resources) remain in firmly place. But in the holiday from history we have taken since the end of the Cold War, we just don’t want to think about it.